I grew up reading the adventures of Tintin – over and over again. Then, on a Grade 2 field trip to Ottawa, the kid in the seat behind me had Plop!, the wonderfully weird comic done featuring Mad genius Sergio Aragones. Over the next few hours I was introduced to a whole new world of offbeat and wonderful comics storytelling. 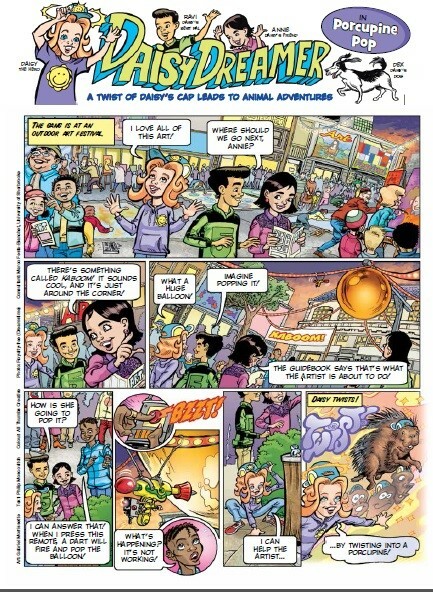 For 14 years (close to 140 issues) I wrote the popular Daisy Dreamer comic for the children’s magazine Chickadee. Daisy’s adventures took her around the world,, and saw her transform into all kinds of creatures including a banana slug, an Albertasaurus, a Siberian tiger, and a blue crab. Here's a a fun little Q&A Chickadee did with me about Daisy. The artist behind Daisy Dreamer is illustrator Gabriel Morrissette, and in addition to working together on Daisy, we collaborated on the historical adventure comic Ultimate Dinosaurs: Giants from Gondwana. Created to accompany the Royal Ontario Museum exhibition of the same name, the comic quickly exhausted its original print run of 100,000 and has now been licensed to museums in the US. I also offer workshops on writing comics. Visit my workshops page for more information.